The 15 countries which make up this subregion are Albania, Andorra, Bosnia and Herzegovina, Bulgaria, Croatia, Greece, Italy, Malta, Portugal, Romania, San Marino, Slovenia, Spain, The Former Yugoslav Republic of Macedonia and Yugoslavia (Figure 30-1). Most of them border the northern and eastern rim of the Mediterranean Sea; two of them, Bulgaria and Romania, lie on the western coast of the Black Sea; and Portugal has a coastline along the Atlantic Ocean. Over most of the subregion a Mediterranean-type climate prevails, characterized by hot, dry summers, although in some areas, for example northern parts of Spain, Italy, Romania and Slovenia, there is considerable precipitation providing good conditions for forest growth. There are very marked differences between countries in the stage of economic development and living standards, those that are members of the European Union (Greece, Italy, Portugal and Spain) being more advanced than those that are in transition from centrally planned to market economies (Albania, Bosnia and Herzegovina, Bulgaria, Croatia, Romania, Slovenia, The Former Yugoslav Republic of Macedonia and Yugoslavia). Three countries, Spain, Italy and Romania, account for nearly two-thirds of the total land area of 168 million hectares in the subregion; they are also the most heavily populated. Three countries, Andorra, Malta and San Marino, are very small and have little significance for the forest economy of the subregion. Forests covered 52 million hectares in the subregion in 2000 (Table 30-1), with other wooded land covering a further 19 million hectares. Forest and other wooded land thus accounted for two-fifths of the total land area, forest alone for 30 percent. On average, there was 0.3 ha of forest per inhabitant in the subregion, but there were quite large variations among countries, ranging from 0.6 ha per capita in Bosnia and Herzegovina and Slovenia to 0.2 ha per capita in Italy. Since ancient times there has been a history of forest destruction to make way for agriculture and other land uses, as well as degradation from excessive utilization and grazing, notably by goats. A further hazard, especially because of the climatic conditions, has been fire, largely caused by humans through negligence or arson. Many of the remaining forests are therefore in poor condition or reduced to scrub and brushland with scattered trees (other wooded land). Less than 700 000 ha, or only about 1.5 percent of the forest area, are classed as undisturbed by humans, the largest areas being reported in Bulgaria and Romania. By 2000, plantations covered about 4.3 million hectares, or more than 8 percent of the forest area, the largest areas being reported in Spain, Bulgaria and Portugal. A distinction should be made between those plantations established primarily for wood production purposes and those whose function is soil stabilization and environmental protection. Although data are not available to separate these categories, much of the planting in Bulgaria and central and southern Spain fall into the latter, and in some cases the rate of growth is quite modest. Plantations in Portugal and along the northern coastal area of Spain are mainly for wood production, many of them with high growth rates, for example of maritime pine (Pinus pinaster) and radiata pine (Pinus radiata) and Eucalyptus globulus. The natural forest area of more than 47 million hectares (Table 30-1) includes the small area of forest undisturbed by humans mentioned above, but consists mostly of what was defined as "semi-natural" forest in the Temperate and Boreal Forest Resources Assessment 2000 (TBFRA) (UNECE/FAO 2000). This is forest which has been used by humans in the past or is being used, with or without being brought under management. Source: Appendix 3, Tables 3, 4, 6, 7 and 9. During the 1990s, the area of forest in southern Europe increased at an average annual rate of about 230 000 ha. In order of importance, the increases occurred in Spain, Portugal, Italy, Greece and Bulgaria. Part of the expansion was the result of regeneration of forest on other wooded land. The rest was due to recolonization by artificial (planting) or natural means on non-forest land, mainly abandoned agricultural land. It is not possible to determine how much of the afforestation and reforestation was through planting and how much took place naturally, but it is probable that most was by planting. 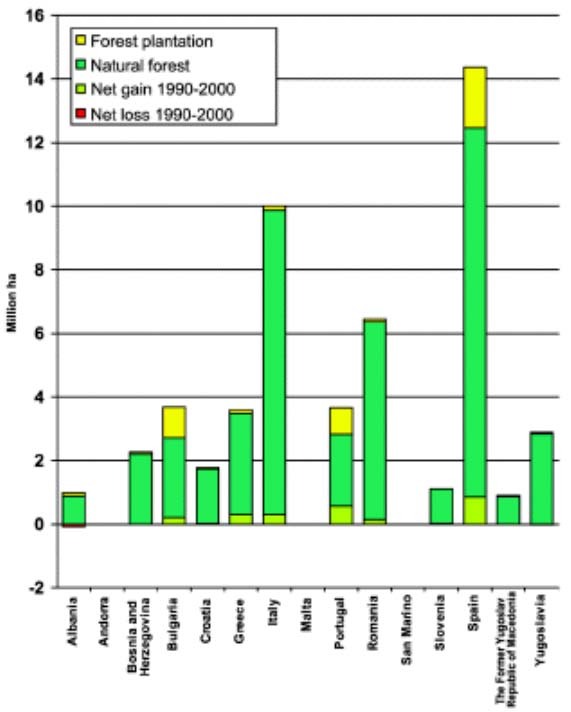 As shown in Figure 30-2, there were net gains in all countries in the subregion with the exception of Albania, one of the few countries in Europe where the area of forest declined. In terms of forest cover, broad-leaved species predominate in southern Europe, particularly in the eastern part of the subregion. Overall, predominantly broad-leaved forest makes up over three-fifths of the forest area, with a further 10 percent mixed broad-leaved/coniferous. Because in some countries the average growing stock volume per hectare in coniferous stands is greater than that in broad-leaved stands, conifers account for a half or more of total growing stock in Bosnia and Herzegovina, Greece, Portugal and Spain, and almost half in Slovenia. Oaks (Quercus spp. ), both deciduous and evergreen species, are the most common broad-leaved species throughout the subregion, with beech (Fagus spp.) also common at higher altitudes, while other species include chestnut, poplar and eucalyptus, the last two mostly in plantations. There are extensive areas of broad-leaved coppice and coppice with standards, notably in Italy, Greece, Spain, Bulgaria and Yugoslavia. Altogether about one-quarter of the forest area in the subregion consists of coppice and coppice with standards. Among coniferous species, pines, notably Aleppo (Pinus halepensis), Scots (Pinus sylvestris), maritime and radiata, are the most common, with spruce (Picea spp. ), fir (Abies spp.) and larch (Larix spp.) also found in certain localities. Spain, which occupies the major part of the Iberian Peninsula, has the largest forest area in the subregion, with 14.4 million hectares or more than one-quarter of the total. It has a further 12.5 million hectares of other wooded land, so that forest and other wooded land accounts for about half the country's land area. The area of forest has been expanding strongly as a result of planting and conversion of other wooded land to forest, despite setbacks due to forest fires. More than two-fifths of the forest area is predominantly coniferous, with a further one-fifth mixed coniferous/broad-leaved. The strongest growth occurs in the maritime and radiata pine and eucalyptus stands in the northern part of Spain, where a large part of wood production also takes place. Elsewhere, forest serves an important soil protection function. About one-quarter of the forest area is not available for wood supply, mainly for reasons of conservation and protection. Portugal, occupying the western part of the Iberian Peninsula, has extensive areas of cork oak and is the world's leading producer and exporter of cork products. It is also an important net exporter of wood products based on its forests of maritime pine and eucalyptus. Because of its long north-south extension and range of altitudes, Italy possesses a large variety of forest types and of flora and fauna. With 10 million hectares, it has the largest area of forest in the subregion after Spain, and nearly 1 million hectares of other wooded land. Predominantly broad-leaved stands make up more than 70 percent of the forest area, of which about half is coppice and coppice with standards. As elsewhere in the Mediterranean area, forest fires are an annual hazard. With 0.2 ha per capita, Italy has the lowest forest area per inhabitant among the countries of the subregion, and is a major net importer of primary wood products (although a large exporter of furniture). The countries that were formerly part of Yugoslavia, namely Bosnia and Herzegovina, Croatia, Slovenia, The Former Yugoslav Republic of Macedonia and Yugoslavia, between them have about 9 million hectares of forest and 1.5 million hectares of other wooded land. In most of this area, mainly broad-leaved stands predominate, as is also the case in Greece and Albania, also on the Balkan Peninsula. Growing conditions in these countries, with the exception of Slovenia, are poor in many places, with degraded soils, and forest fires are frequent. Bulgaria and Romania are the two most easterly countries of the subregion. Between them they possess over 10 million hectares of forest, in which predominantly broad-leaved stands are the major part and beech and oak are the most common species. The structure of Romania's forests is oriented towards the medium-age classes, and increment, which exceeds fellings by a considerable margin, is above the European average on a per hectare basis. This is also the case for its per hectare volume of growing stock. In Bulgaria, there is an active programme of afforestation and forest improvement, more for soil protection reasons than for wood production; growth is appreciably higher than present cutting levels. Because of the large areas of hills and mountains, fragile soils, difficult climatic conditions and the risk of forest fires, the protection role of forests is important in many parts of southern Europe. About one-quarter of the forest area is not available for wood supply, mainly for conservation and protection reasons, but in some localities also for economic reasons, that is to say inaccessibility. The largest areas of forest not available for wood supply are found in Italy, Spain, Portugal and Bosnia and Herzegovina. Roundwood removals amounted to about 54 million cubic metres under bark per year in the late 1990s on forest available for wood supply, where the major part of total removals occurred. After adding the on-bark percentage on the felled trees and unrecovered volumes, fellings (removals plus unrecovered harvesting losses) on forest available for wood supply amounted to more than 65 million cubic metres over bark, the largest volumes being recorded by Romania, Portugal, Spain and Italy. This volume is barely half of the volume of net annual increment, meaning that the volume of growing stock is rising quite strongly in the subregion. The extent to which the net annual increment (NAI) exceeds fellings varies considerably from country to country. Fellings to NAI ratios are particularly low in Bosnia and Herzegovina, Slovenia and Spain. Fellings are almost equal to NAI in Portugal, where there has been a marked expansion in wood-processing capacity in recent decades, and in The Former Yugoslav Republic of Macedonia. In several countries, the low fellings to NAI ratio is explained by the orientation of the age-class structure towards young and medium-aged stands. There is also a wide range of NAI volumes per hectare between countries, as well as within countries, reflecting differences in growing conditions. In Romania and Slovenia, average NAI is more than 5 m3 per hectare, which is higher than the European average. In Portugal and Spain the average is 6.8 and 2.7 m3 per hectare respectively, but some pine and eucalyptus plantations in these countries are among the fastest-growing in Europe. Fast-growing plantations are also found in other countries, for example poplars in Italy. In Albania, Greece and The Former Yugoslav Republic of Macedonia, NAI is reported as being only around 1 m3 per hectare. In southern Europe as a whole, more than half the forest area is publicly owned and less than half is in private hands. This conceals, however, wide differences in ownership patterns between countries. In Albania and Bulgaria, all forest is State property, and the proportion is about three-quarters in Bosnia and Herzegovina, Croatia and The Former Yugoslav Republic of Macedonia and more than 90 percent in Romania. In Italy, Portugal and Spain, the State owns relatively small areas of forest, while other forms of public ownership, mainly by municipalities and communes, are more important. In these three countries, ownership by private individuals is by far the most important ownership category, with more than three-quarters of all forest in Portugal and Spain and two-thirds in Italy. Particularly in Spain and Italy, the average size of holdings is very small and the number of private owners correspondingly large. Ownership by forest industries is quite important in Portugal, with 10 percent of the total, with smaller areas in this category also in Italy and Spain. Other forms of private ownership, for example by cooperatives, are found in Spain and Greece. In some countries that formerly had planned economies but are now changing to forms of market economy, privatization or restitution of some forest areas has been taking place. This has progressed particularly rapidly in Slovenia, where three-quarters of the forest is now owned by private individuals, and to a lesser extent in Bosnia and Herzegovina, Croatia, Romania and The Former Yugoslav Republic of Macedonia. In Slovenia, private forests were not nationalized but only managed by the State. With the exception of Andorra and San Marino, all the countries in southern Europe provided national-level information on the forest area managed (Table 30-1), applying the definition used by industrialized countries of forests managed in accordance with a formal or an informal plan applied regularly over a sufficiently long period (five years or more) and including areas where a decision had been taken not to undertake any management interventions. The extent to which countries' forests are managed varies considerably. Bulgaria, Romania and The Former Yugoslav Republic of Macedonia report that all their forests are managed. In contrast, relatively low proportions are reported to be so by Albania, Greece and Portugal, and especially Italy. In Italy only 11 percent is shown as managed, as only formal management plans were included, which mostly applied to forest in public ownership. The wide differences reported by countries in the extent of management of their forests may partly reflect the difficulties in applying the definition of "managed forest" used for TBFRA to national conditions or in obtaining comprehensive data. The definition includes forest under both formal and informal management plans; it may be difficult to determine the areas under informal plans, especially in the private sector. In total, approximately 35 million hectares, or 67 percent of the total forest area in southern Europe, were reported as being managed in accordance with a formal or informal plan. Wildlife and hunting activities have been recognized as relevant practices in this subregion. There is a wide variation in the types and quality of the forests growing in southern Europe. Because of the long-term historical pressures on the forest from overexploitation and the often difficult growing conditions, it would be true to say that many of the "natural" forests are of relatively poor quality. This represents a major challenge to managers, who often lack the resources, human and financial, to apply more intensive silviculture to these forests. At the other extreme, there are important areas of plantations managed for wood production, where levels of management and silviculture are very high. As elsewhere in Europe, there is a growing awareness on the part of the public and the policy-makers of the importance of forests in providing environmental and social benefits, as well as wood, and this is reflected in the growing interest in the way in which forests of all types, both natural and plantation, are being managed. Certain practices, such as the use of exotic species like eucalyptus in plantations and the replacement of existing broad-leaved scrub by pines, are sometimes being called into question. The perennial problem of forest fires remains acute in most of the countries of southern Europe. A large proportion of all fires each year in Europe occur in these countries, and the principal cause is human. Many are started accidentally or through negligence, for example, through fires started on agricultural land spreading into the forest, but a large number are also set deliberately for a variety of social, economic or political reasons. The degradation of ecosystems through overgrazing has also made them much more vulnerable to human-caused fires. Local population density has declined with urbanization, so fires are not detected and extinguished as fast as they would be if the rural areas were more densely populated. The increasing number of visitors to forests also poses an additional fire threat. Demographic changes have often led to reduced silvicultural and harvesting activities and fewer grazing animals entering the forest, resulting in a build-up in the amount of fuel and greater risk of any fire that breaks out being of greater intensity. Foresters have a major task not only in fighting forest fires but also in educating the public on their prevention. The climatic conditions in the subregion, especially the hot dry summers, are a major factor in raising the risk of fire. Linked to possible changes in global climate, there have also been growing concerns in some parts of the subregion, such as the south of the Iberian Peninsula and southern Italy, about the threat of desertification. This has emphasized the need for forest protection measures and, where appropriate, afforestation for soil conservation. With increasing industrialization and the gradual shift of populations from the countryside to towns, the problem of maintaining viable rural communities has been becoming increasingly acute in most of the countries of the subregion where in the past agriculture was a major activity. Considerable areas of marginal agricultural land are being abandoned. While forestry might in many cases seem to be a solution, the economic and social problems of this as a suitable land use alternative are considerable, not least the funding for afforestation and reforestation projects and the organizational arrangements needed to ensure the proper maintenance and eventual use of new forest and rejuvenated areas. It remains uncertain, therefore, how fast and how far the expansion of the area of forests that occurred in recent decades will continue in the subregion. The volume of annual fellings in southern Europe is only about half the net annual increment, even less in some countries. This is leading to a rise in the volume of growing stock and contributing to carbon sequestration, and in most of the countries is a consequence of the relatively young age-class structure of the forests. It does raise the question, however, whether sooner or later greater use should be made of the wood production potential of the subregion, not only to enable the forests to make a greater contribution to the economic welfare of society but also for ecological and fire prevention reasons. This is not to suggest that fellings could be doubled to equal the present NAI, but there is undoubtedly scope for some expansion without jeopardizing in any way the sustainability of the forest resource. It would involve the development of the wood-processing capacity in some countries, the main exception being Portugal where it has already expanded to the point where virtually all available wood supplies are fully committed. Italy and Spain are major net importers of wood products, and there could be scope for import substitution in these and some of the other countries. Modernization of its industries could also enable Romania to regain its position as a sizeable exporter of wood products. Romania, Bulgaria, Albania and the countries of former Yugoslavia are all in the process of transforming themselves towards forms of market economy and of raising the living standards of their people towards the European average. In all of them, consumption of wood products is still fairly low and would respond to the stimulation of economic activity, notably in the construction sector; provision of more and better housing is likely to be one of their priorities. This is a long-term process and involves the replacement or modernization of their industries, including the wood-processing industries, which are generally obsolete or undercapitalized, and development of their infrastructures. It also involves the privatization of parts of the economy and attracting foreign assistance, including direct foreign investment. Given the long-term potential to increase the wood supply of most of these countries, Albania being the exception, wood and wood products could play an increasing role in strengthening their economies. The countries of former Yugoslavia have a special problem arising from the conflicts and disturbances that have occurred during the break-up into the present five separate countries. Considerable damage has been done to the industries and infrastructure of these countries, as well as to the forests in some areas. Only Slovenia appears to have been relatively spared. The possibilities to restore and strengthen the forest and forest industries sector in these countries are largely dependent on the stabilization of the political situation, which will contribute to raising their attractiveness to foreign investors. A major obstacle to achieving fuller use of the forest resources in the subregion, whether for wood supply or for environmental or social objectives, is the ownership of a substantial part of the forest area by a very large number of small private owners. Small-scale forestry operations are seldom as profitable as larger ones, and it is more difficult to achieve effective management and planning. For political reasons, consolidation of properties into larger units, either privately or publicly owned, is generally not acceptable, and consequently other solutions need to be found. Among these could be the grouping of properties into management or marketing cooperatives, as has been done in a number of instances. Before getting involved in the cost and effort of such initiatives, however, it would be necessary to determine what is the actual and potential contribution that small forest holdings make to the overall forest economy, notably through the production and sale of roundwood. At present, it is probable that it is much less than their share of forest area, and it would need to be determined whether their contribution could be significantly improved by joint action. If it should prove difficult to justify action on economic grounds, it would still be necessary to consider whether, by leaving things as they are, there would be long-term negative consequences regarding the environmental and social functions, increased risk of forest fires being one example. Given the fragile environmental situation and evolving social conditions in several parts of southern Europe, there may indeed be a strong case for supporting a greater role for forestry. That still leaves open the difficult question of how such support should be organized and who should pay for it. UNECE/FAO. 2000. Forest resources of Europe, CIS, North America, Australia, Japan and New Zealand: contribution to the global Forest Resources Assessment 2000. Geneva Timber and Forest Study Papers 17. New York and Geneva, United Nations.